If you love and appreciate the Asscher cut diamond, then our Asscher Cut Petite Pave Solitaire Engagement Ring is a great ring that showcases the gorgeous and unique asscher cut square diamond look stone. 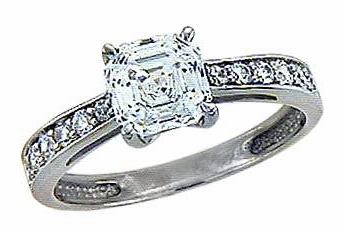 The unique asscher cut faceting provided a clean and upscale look with elongated step factets very similar to a step cut emerald cut but with a modified square shape. This solitaire ring is available with your choice of a 7mm 1.50 carat or an 8mm 2.50 carat asscher cut inspired center stone with a single row of pave set cubic zirconia round stones accenting the slopes of the shank. The shank measures 3mm at the widest point. Due to extremely low pricing, all clearance sales are final. Clearance items are stocked in a certain finger size(s) and may be sized for an additional fee. Please see menu options below.